Are you feeling a bit like a kid in a candy store when you consider all of the available marketing technologies? Marketing technology has been evolving at a rapid pace, and with so many choices, it’s easy to be overwhelmed. These technologies are often referred to by three letter acronyms such as DAM/MAM (digital asset or marketing asset management), MOM (marketing operations management), MAP (marketing automation platforms), and MRM (marketing resource management). They include everything from platforms and tools, to support Campaign Management, Digital and Online marketing, Social Media platforms, Marketing Analytics, workflow, Performance Management, and reporting. Marketing technology and all that it entails is here to stay, but the challenge is to keep up and select the right tools. The technologies you choose, how you implement them, and the processes and skills you need to properly use them will greatly impact your capabilities, and how well the technologies serve you in improving and proving the value of Marketing. This brings to mind some sound advice from my father. I loved going to Sears with him (yes I just dated myself, no Home Depots or Lowes back then) and marveling at all the Craftsmen tools. When we first started building my tool box, we created a list of the basics and the order in which to purchase them: a sturdy tool box, a measuring tape, a hammer and nails, screwdrivers and screws, pliers, and a wrench. Money permitting, I would purchase one of the tools from the list and he would then carefully instruct me how to use it safely and properly. As you examine your marketing technology (tools), do you have the basics and know how to use them proficiently? If not, your first step is to create your list; this becomes your technology road map. Do you know the purpose of that tool and what problem it solves? Is it a general-purpose tool or something that is designed to solve a specific problem? Do you already have all your general-purpose tools? How likely and how frequently will you face that specific problem and really need the special-purpose tool? How does it fit in with the tools you already have? Do you know what it takes to use it and do you have a plan to learn how to use it properly? It seems like my dad’s advice serves marketers too as we choose our marketing tools. Develop your requirements and selection criteria; create your road map so you have a plan for what tools you need to add, for what purpose and when. If the situation changes, modify your road map. Take into account what you will need to make the tool work (data, processes and skills) and build this into your timing and investment. Have a plan for usage and adoption otherwise the tool will just look pretty in the toolbox. This entry was posted in Uncategorized and tagged CMO, marketing plan, Marketing Roadmap, marketing strategy, Marketing Technology, Marketing Tools. Are you one of those superhero marketing organizations? You know, the “1-800 I need a presentation, brochure, case study, or email campaign NOW” marketing organizations that takes urgent requests and turns on a dime? Feeling pretty good about your responsiveness? If you said “yes,” we’d tell you congrats for being such a terrifically honed tactical machine, but—and, yes, there’s a “but”—we’d also tell you it’s your own fault if you feel as if you’re a hamster on a wheel. There’s a difference between being a service organization to Sales and being a value generator for the company. As marketing professionals, our future depends on being the latter. And, if you decide you are primarily a service organization to Sales and desire to be a value generator, see the five key steps at the end of the article for ideas on how to make the transition. You know you’re a marketing organization that operates as a service organization if your day-to-day work primarily involves converting inputs (requests) into desired outputs (presentation, campaigns, collateral, etc.) through the appropriate application of resources (talent, information, etc.). When Marketing acts as a service organization, its objectives and priorities are typically focused on service delivery (time, quality, and budget) and on Sales satisfaction (measured in “qualified leads generated by marketing”). Those types of measures often dominate the conversation between the two organizations, and this type of marketing organization aims to serve and solve tactical problems as efficiently and effectively as possible. Some marketing organizations that operate in this fashion can be proactive, but ALL marketing functions that operation in this fashion must excel at being reactive. The challenge for these organizations is that it is very difficult to actually measure the contribution and value of Marketing, and the impact of investments in Marketing. You know you’re a value generator if the work you are producing increases the worth of the organization’s goods/services, or it is focused on initiatives that create better value for customers, leading to appreciating share of wallet or loyalty, or better value for shareholders who want to see their stake appreciate. Marketing organizations that act as value generators may be reactive at times, but true value generators are proactive. They believe it is their responsibility to identify, investigate, evaluate, recommend, and prioritize market and customer opportunities. These marketers focus on improving and implementing changes that will maximize the organization’s success and enable it to stay abreast or even ahead of market, customer, and competitor moves. Product adoption/acceptance, customer acquisition, customer retention, customer growth, market share, etc. tend to dominate the conversations among this group. Most of us have come to accept that we have the main responsibility of achieving profitable revenue growth derived from acquiring and retaining profitable customers. This definition and focus suggests that Marketing as a business function is intended to be a value generator, a task we jointly and equally share with our very important partners in the sales organization. Creating customer value is increasingly seen as a key source of competitive advantage. The aim of all businesses is to create a value proposition that is superior to and more profitable than those of competitors. That value proposition becomes the basic ingredient for the company’s positioning. Trout and Ries introduced us to the idea that the company positioned as the leader gets about 50% of the market, No. 2 gets 25%, No. 3 gets 12.5%, and the rest of the competitors split the remaining 12.5%. Marketers who are value generators are responsible for positioning, and a key first step to transition to a value creator is to create and maintain the company’s positioning and all that entails. Take the lead on keeping conversations and investments focused on developing a continuous stream of products and services that offer unique and compelling benefits to your customers. Some of your first efforts might include, but shouldn’t be limited to, product and process efforts, gaining insight into the needs of well-defined segments, harnessing data and analytics to accelerate efforts within existing markets or to create new markets, and reconfiguring company and/or industry value chains. Establish and own a sustainable process of value creation. If the work at hand doesn’t meet the criteria, discuss where it fits among the priorities for Marketing. Marketing strategy is the critical link between marketing goals and marketing programs and tactics. Strategy selection provides focus and enables an organization to concentrate limited resources on building core competencies that create a sustainable competitive advantage to support pursuing and securing the best value creation opportunities. It provides the guidance and direction for channeling the organization’s marketing resources to generate market traction, penetration, and dominance. Opportunities don’t linger in today’s fast-paced dynamic customer-driven market. Remember, the time value of money concept says money received today is better than money received in the future. Speed of opportunity execution is just as important as speed of opportunity identification. Although the two types of marketing organizations are not mutually exclusive, marketing organizations on the hamster wheel rarely have the time, talent, or budgets to be value generators. 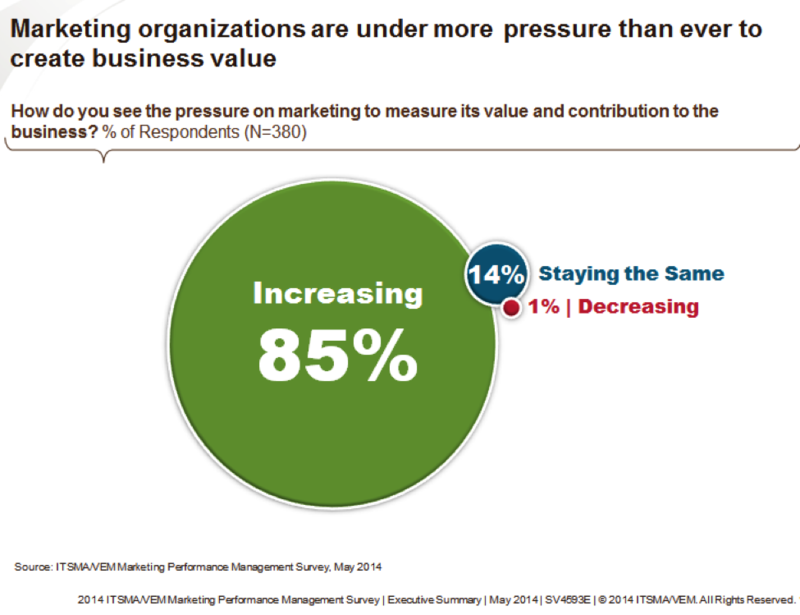 The rub is that today’s executives often expect more from marketing than servicing Sales. 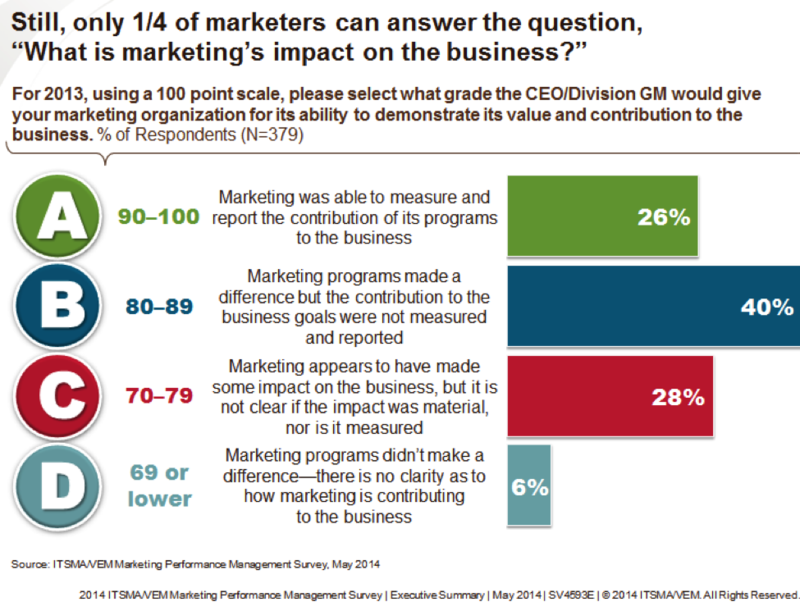 The C-Suite expects a measurable return on its marketing investment. To meet that expectation Marketing must be able communicate how it is relevant and to more resemble a value generator than a service provider. Generating value for the business requires working the numbers, then tracking and reporting on the performance to the numbers. Taking a customer-centric view rather than an internally oriented Sales-support revenue-centric view and “doing the math” facilitate the creation of a marketing organization that is relevant, that can measure its value—and, more important, affect revenue and profit. This entry was posted in Uncategorized and tagged CMO, Marketing, marketing plan, marketing strategy, Marketing Value, sales and marketing, value generator.